Flour Shop, the colorful Manhattan bakery that’s brought a collective grin to its fanbase far and wide, is now passing along the joy of creating its incredible cakes through a new book by founder Amirah Kassem. Kassem, a native of Juarez, Mexico, who grew up with an intense love of bright hues, making messes, and all things creative, started her career in fashion, first in Los Angeles and then in New York. 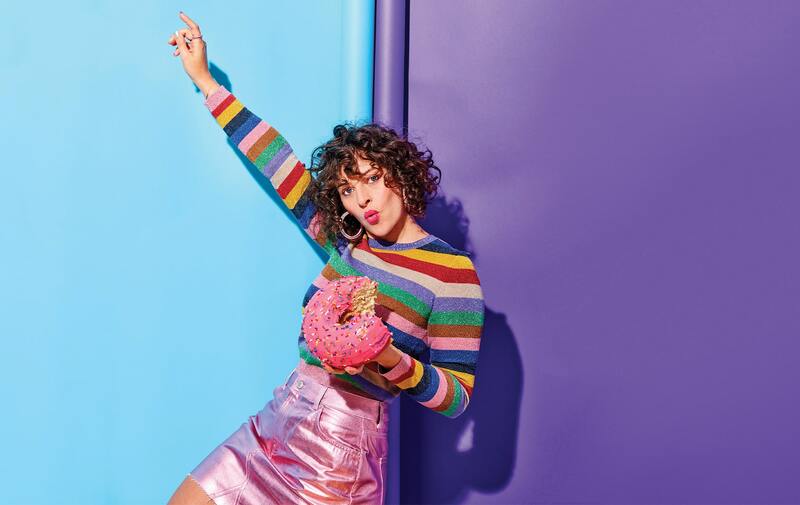 It wasn’t until her friends in NYC began to gush over her elaborate confectionary creations that she realized her true calling wasn’t necessarily in designing things to wear—unless you count the crumbs or icing that might drop on someone when they’re enjoying her elaborate cakes. 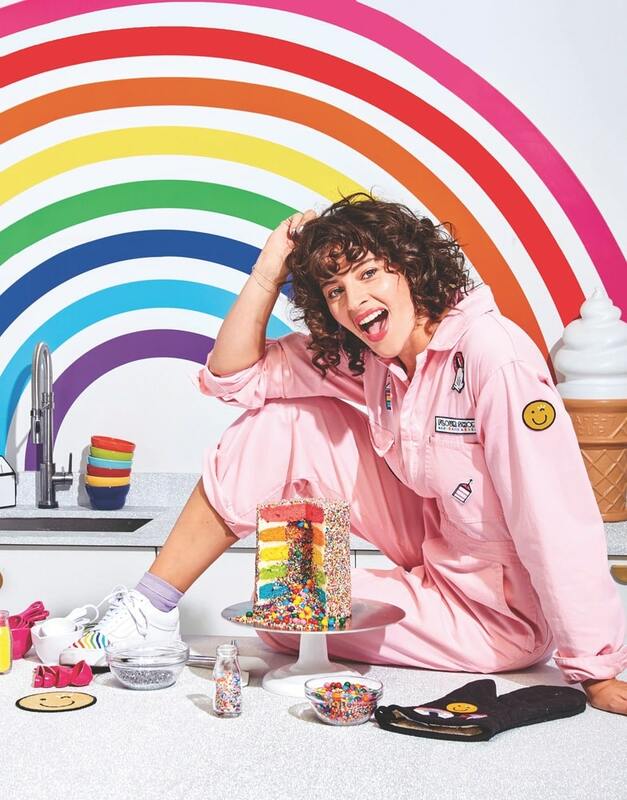 Her love of making her friends and family happy on their birthdays with her signature “explosion cakes”—multilayered towers of cake filled with candy and sprinkles that spill out when you cut the colorful dessert—eventually convinced her to focus on a culinary career in 2012. She’s been coloring outside the lines of the traditional baking business ever since and opened the Flour Shop storefront in 2017. “I don’t remember most of the gifts I got as a child, but I still remember those moments when we blew out the candles on my cakes, and I still remember the cake,” says Kassem in the intro to her new cookbook (she says it’s actually a “cake book”), The Power of Sprinkles, released by Abrams publishing on April 9. We caught up with Kassem to talk about her cake book, recent collaborations, and, of course, food! Kassem shows off her favorite color—rainbow—with her signature Rainbow Explosion Cake. Her book even includes a recipe for the Cara the Unicorn version. VIE: Congratulations on your new book, The Power of Sprinkles! What inspired you to take your culinary creations and expertise and transfer them to the literary world? Amirah Kassem: Thank you! 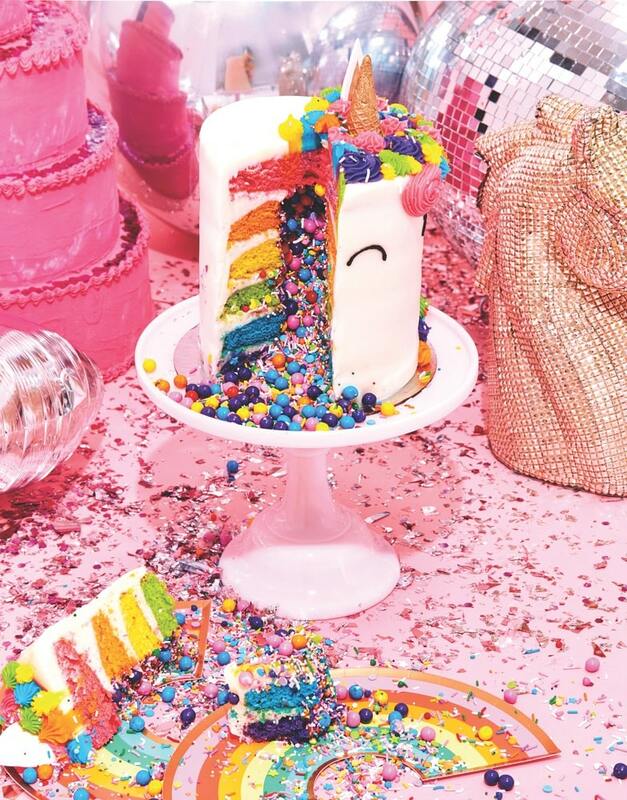 Almost every day we get tagged in photos and videos of people trying to make our signature rainbow explosion cake, asking for tips and tricks, and this book will have it all. I’m so excited to share it with the world! VIE: We love how fashion and food are inextricably linked in your life and your creations—why do you think they make such a fabulous yet seemingly unlikely pair? AK: Colors, textures, creativity, and imagination all play a part in both industries, and it came naturally for me to combine the two worlds. 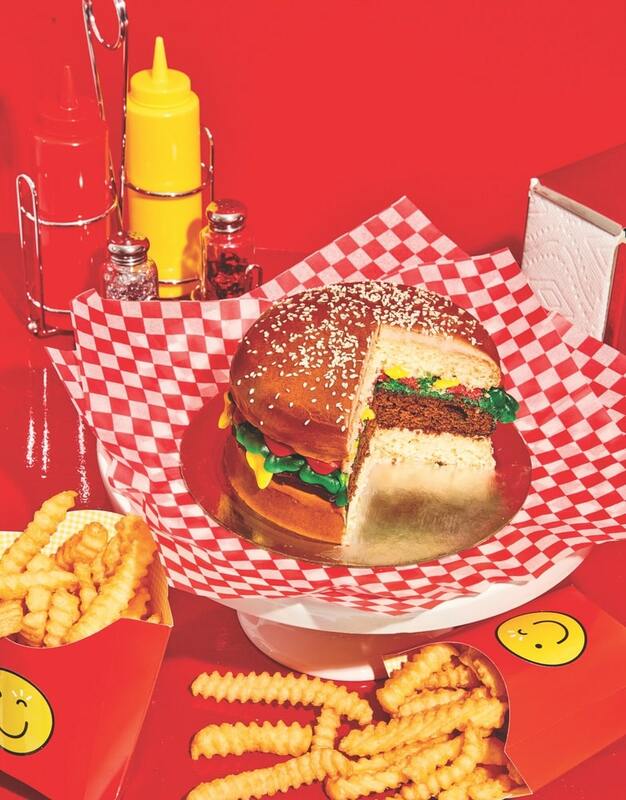 This cheeseburger cake (yes, it’s a cake!) is another recipe found in The Power of Sprinkles. VIE: You say you got started when you were nine years old by baking a cake covered in M&M’s for your brother’s birthday, and cakes are your specialty—do you have a second favorite thing to cook? AK: Pizza, ice cream, pasta, guacamole, mac and cheese, and pancakes—basically, just all of my favorite foods. But also cookie cakes! VIE: The Power of Sprinkles includes a ton of tips, tricks, and even the recipes for your Bonilla Vanilla Cake (named after your mother), your Magical Frosting, and lots of other fun confections. Why did you decide to give away your “secrets”? AK: I don’t consider them secrets; I just want to share my magic with the rest of the world! I have so much fun doing what I do and spreading joy. Seeing other people’s creations is what makes me happy. I just want to share my magic with the rest of the world! I have so much fun doing what I do and spreading joy. VIE: The book is full of cute graphics and emoji-style artwork in addition to Henry Hargreaves’s fantastic photography. Did you design these signature elements for Flour Shop or did you work with another artist to create them? AK: This was a huge part of my branding, and although most of it comes from what I think the inside of my brain looks like, the artist behind the execution is Vanessa Kreckel of Two Paper Dolls. I work very closely with her on all of my projects. She really gets my vision and fully designed the layout of the book for me. I don’t know what I would do without her, and the same applies to Henry Hargreaves—he sees angles and colors that are just so unique. Breakfast is ready! Kassem with her Baba Pancakes cake. VIE: Speaking of collaborations, you’re releasing a collection at Williams-Sonoma this May. Can you tell us a little about it? AK: I have been working on it for a couple of years now and can’t wait for you to see it! Finding the balance between luxury and fun was key to the collection. It includes everything you need to live the birthday lifestyle from the kitchen to the table! VIE: What do you find most challenging about collaborating with others on creative endeavors, whether it’s culinary, literary, a product line, fashion, or something else? AK: Not being able to be everywhere at once. I find it hard to let go of different aspects of the process. Learning to work with things out of my control has been great practice for all the collaborations I’m working on. Learning to work with things out of my control has been great practice for all the collaborations I’m working on. VIE: What advice would you give to someone who is just beginning to get into baking as a hobby or as a potential profession? AK: Don’t ever let go of why you like to do it; have fun! Don’t look at what anyone else is doing; draw inspiration from within. If you can dream it, you can bake it! VIE: Is there any other Flour Shop news coming up for 2019 that you’d like to share? AK: A lot’s going on, so stay tuned! VIE: What’s the craziest custom cake you’ve created? AK: I rarely think things are crazy because a six-layer rainbow explosion cake is our standard. I love matching cakes and prints, especially from my favorite Alice + Olivia fashion collections! VIE: What’s your favorite color and why? AK: RAINBOW! It combines all of the best colors, so you don’t have to pick just one. 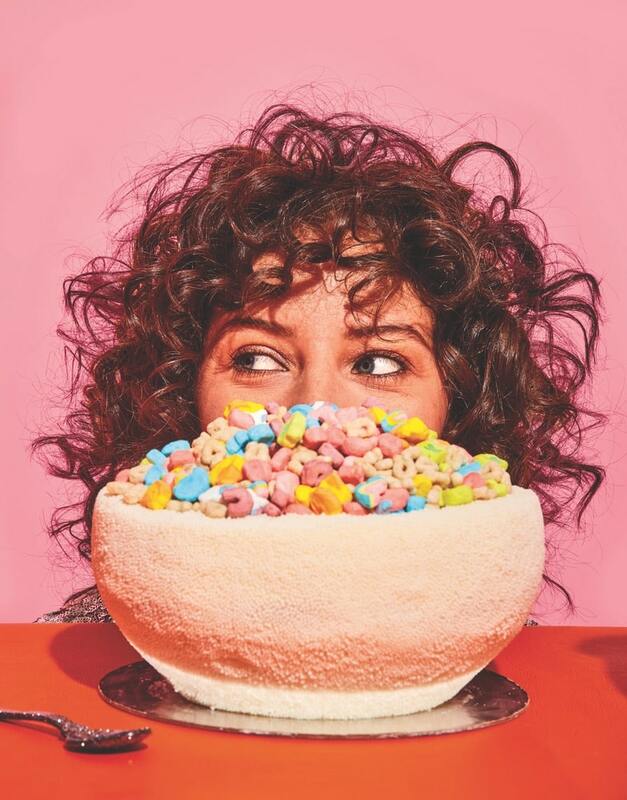 Although she didn’t like cereal as a child, Kassem admits it’s now another of her favorite foods—hence the inspiration for this “CEREALously Delicious” cake. VIE: What’s your favorite thing in your kitchen? AK: My powerful pink KitchenAid mixer from Williams-Sonoma! It can make it all. It’s the biggest help in the kitchen apart from my husband, Ross Harrow, who has recently become quite the chef himself! VIE: What do you love about living and working in New York City? AK: Pizza! But also the energy in NYC is like no other. I wake up full of ideas and feeling ready to conquer the world. VIE: Finally—and this might be the most difficult question of all—cake or pizza? AK: Easy . . . PIZZA CAKE!!! Why choose one when you could have both? Visit FlourShop.com to learn more or order your copy of The Power of Sprinkles at PowerofSprinkles.com!